Insight Into Further Enhancement And Growth, That https://steemgigs.org Seeks To Bring About For Steem. We will like to explain its gradual evolution and show gratitude for your ever-present patience and implore that you kindly exercise further patience. It has been a slow journey and this we know, but it has been an existing journey. While a completed https://steemgigs.org can easily be seen as a representation of the entire journey, it only constitutes part of the journey. Identifying with this, will help us exercise some more patience with regards to the completion of the website. @steemgigs has existed before https://steemgigs.org. It started right here on steemit, under #steemgigs. Then continued into a now solid SteemGigs community on the discord, containing more than 4,500 steemians. So, community has been a core part of the journey. Beyond that though, SteemGigs is part of an entire curriculum. Being part of a curriculum, it doesn't just happen; "it has to play itself out". While other steem-based websites may come into life and even completion really quickly; SteemGigs is modeled differently. Another thing is; "with what SteemGigs represents, "everyone" is key. SteemGigs is very broad and plays a very important role in an entire curriculum called "surpassing Google" with steemit". @steemgigs is called "SteemGigs" to indicate the very key involvement of steem and steem's evolution, in the journey (our journey). SteemGigs is not just out to form a stand-alone organization. It is also out to enhance steem and grow it. Steem is not where it used to be, neither has it stopped evolving. You may find other steem-based apps starting up and coming to full-blown life pretty fast but SteemGigs' evolution is very different, one reason being that; it looks to enhance steem and some of the challenges that appear to affect many users of steemit and takes much of steem's history and evolution into cognizance. While SteemGigs, tries to create a revolution in the freelancing marketplace, using the beauty of the steem blockchain and its community; it also tries to enhance matters like "content curation" and "discovery" here on steemit and looks to try new paradigms, in a bid to explore the full vastness of steem's beauty e.g we would attempt to add other facets to the steem's "reputation model". Looking at reputation here on steemit, we quickly pinpoint "transparency". Being bare (the steem blockchain), users are likelier to be weary of their actions, maintaining "good reputation" etc But there can be more amazing facets to this, if we look closely. Just what if, we apply also the "privacy" paradigm of the Steem blockchain, adding it to the current steem "reputation-model", that is based mostly on transparency? Yes, while the steem blockchain is bare; "transparent", there is also a "privacy paradigm"; i.e it is private, decentralized, untraceable etc and a primary incentive for some who join steemit/to join steemit. That is; with https://steemgigs.org, what if we tried to apply a "not-very-tapped" beauty of the steem blockchain, with respect to "reputation"; which is "privacy". Moreso, since community is at the core of SteemGigs, let's now add "community" into the picture and there'll instantly exists a "real life" paradigm and thus, "virtues like "respect"" and we may now have, a new, enhanced or different "breed of reputation model". and now, that we have established that SteemGigs has a "real community" and thus, the "real life" paradigm, should forget virtues like "respect"? Yes, it is bare but does that instantly mean that we should peer? (e.g data on steem). Yes, the bank vault was left open, will you be exempted from court judgement, when you "stole in lorries", on the excuse that the vault was left open? There is an open door, must you enter? The stranger next to you is looking at his bank transactions using his tablet, at an open-public-party, themed, "today, you can into my tablet"; Yes, you can look into his tablet but must you? Hahaha according to me, the real beauty of the steem blockchain, when it comes to matters like "reputation" is, "when you can actually apply it to use, to levels where, each steemian begins to "be reputable", without triggers. Note: all along, i have been trying to touch on one of the several reasons, that the development and completion of https://steemgigs.org has been slow and gradual. Basically, i am trying to use this post to express gratitude for your ever-present patience and to re-establish, that we are on track, on a journey and we will get to our destination, together. Now, going back to SteemGigs (our reputation model), one can instantly say; "why waste time and ages and months in completing that aspect of your website, when you can just easily integrate the "steemconnect escrow capability", since SteemGigs is like a freelancing marketplace and involves payments" but we may say; "how about trying the more testimonial, harder, slower route and try instead, to tap into other aspects of the steem blockchain that amplifies its beauty e.g add a paradigm that mines "real reputation", as opposed to "reputation" borne out of, say "responsibility" (because "people may be watching")". So instead of jumping in on "escrow"; we are playing-out "a testimonial system" involving full-blown SteemGigs posts and whenever we decide to take on "escrow", it will be optional. Bottomline is; SteemGigs is not only its own website. It is being built to amplify steem's beauty too and even "steem" is still in a state of evolution. Like Steemit, "SteemGigs is the first of many experiments, that will form the basis for all other projects, that i will embark on e.g TearDrops, Un(dis)talented, surpassinggoogle.com, Ulogs etc . Same as "steemit" evolves gradually as (according to my mind's eye) it constitutes a play-out or sandbox, for the main "vision within the dream", to evolve the main "vision within the dream" into spanlessness and solidity. e.g While one may be quick to say; "steemit is slow in bringing about enhancement; it has many flaws; it isn't promoting itself aggressively; it isn't representing itself in events etc and other blockchain-based social interfaces etc are popping up really fast". Hahaha, i tell you, "many of these, have had to look at steem's own evolution, to build theirs". Plus, whichever one pops up, will still hold people and perhaps, the incentive to earn, among other things. Hence, since steem is build-able, why apply not simply apply https://steemgigs.org into helping matters. While one may see "flaws" with steemit or steem; i see a beautiful exciting challenge. "Hahaha, blockchain was built for humans and are humans flawless and will all these other blockchain-based social platforms not host humans?" Thus, building SteemGigs can't be as fast as one may expect, because it looks to enhance and grow steem as well. "Surpassing Google" very much involves "world adjustment" and https://steemgigs.org plays a large role. An important part of SteemGigs is its community. The very power of SteemGigs is; "everyone". SteemGigs was born to be a "Dream-Building" center. @steemgigs was also created at a time, when i was trying to add all my innovation projects into a singular entire curriculum, as there became a point in my steemit journey, during my minnow days, when i was beginning get too overwhelmed. Where i am at "inspiration" is too scarce, thus, at times like those, i sustained my inspiration by creating a singular venture, through which all my innovations can easily go through; like a Mother hen and "@steemgigs" was it at the time. So, you will see that while the surface of https://steemgigs.org is a steem-based freelancing marketplace, its preface and core had other grander facets to it. This has made the journey slow as we grow SteemGigs into utmost spanlessness, with all the other upcoming steem-based websites in the pipeline staging live on https://steemgigs.org first, before entering full-blown life. You will notice, that we have since added a knowledge-bank called "SurpassingGoogle" and even Teardrops is currently in its evolution even on https://steemgigs.org. There is a large likelihood that our recent ULOGS movement will play itself out on https://steemgigs.org first. More recently, i have been able to add more funds to the budget for the development of SteemGigs and i am awaiting further updates in the coming weeks. We also got a designer to give the UI for SteemGigs a lift. We are also enhancing all the specialized editors on the website. In the meantime, we have restored life to the SteemGigs server on discord. We have had the second SteemGigs talk already, within the past few weeks and the next one, will come up likely this Saturday. The general tone of the SteemGigs server on discord is "everyone has something to offer" and the general theme of our voice discussions is "Dream-Building". Basically, a SteemGigger is a Dream-Builder. However, as you have seen, in the underlying core of the SteemGigs model is a "real-life" paradigm (a school of life curriculum), to where every SteemGigger is "a dream-builder, who is also the awesomest version of "human". Many more SteemGiggers in the world; many more impossibilities in the world, will become possibilities; "world adjustment". Well, we can't change the world and we can't just adjust it as it will take an entire curriculum. I will be posting an update for the next SteemGigs talk show and this time, i will posting an organized format for each show. Please join the SteemGigs discord server and kindly add some notification for @surpassinggoogle to stay notified. I will also post a summary of the last two voice discussions for us all to benefit. The 'evolution of steemgigs' is growth, it is development, all geared towards giving the best experiences. And need I say that being a part of this 'evolving experience' has been uniquely wonderful and just like a chrysalis, we await its unfolding, its complete metamorphosis, its beauty. I am so much looking forward to steemgigs. org. Move on colossally, you have formidable allies, your 'celebrities'. I am so happy that somehow all my proposal in steemgigs were honored. Just like you @penking I never regreted also that I joined steemgigs community. to explore steemgigs and have a first hand feel of what Terry Ajayi @surpassinggoogle has to offer and don't forget to give him a witness vote by visiting "https://steemit.com/~witnesses" and typing in "steemgigs"at the first search box. "While one may see "flaws" with steemit or steem; i see a beautiful exciting challenge. "Hahaha, blockchain was built for humans and are humans flawless and will all these other blockchain-based social platforms not host humans?" I know right from the start when you started this journey, Every steemian is witness of this great project. Every single steemian was part of this great project. Dear @surpassinggoogle we all are with you, go for it and just call us whenever you need us. Thanks and always stay blessed! Helo @sir Terry, thanks for the update, you are simply amazing, i admire your strength being able to pioneer all this projects. Yeah, I admire him also, he is a blessing to us. Yeah! We are always with you. Thanks for enlightenment and insight as it concerns the steemgigs.org. Steemgigs have played a major role in, thanks for this overview. we all are with you, go for it and just call us whenever you need us. More power to steemgigs.org. Hoping for the best out of it. I really can't imagine the time, when steem was just 7 cents. It's just unbelievable. Recently I read post of one of the earlier steemien talking about how it was hard two years ago to earn any Steem, how much has Steem evolved since then. We should be so lucky 🍀 to be part of this comunity. I’m so glad to see @steemgigs and many other projects to evolve and grow so much. I wish you and them the best and soon for @steemgigs to reach at least 10k followers. They are one of my four witnesses and I’m proud of it. Keep up the great work! With Steemgigs, dreams do come true indeed and everyone is key. The impact and progress recorded by steemgigs is quite innumerable and surpassing in nature indeed. Absolutely, I agree with you. And steemgigs is just one of those tools he has successfully use to perform wonders. I can see so much passion in whatever you do, in this case with Steemgigs.org. it is no surprise that it is successful! And it is inspiring how you do not give up, you are ever-patient through this slow journey to success. Jehovah bless you Terry, bless us all! We are grateful for all these updates. You are so great sir. I thank your for arranging the @steemgigs and #ulog. Now we can share a good content to many people. This way steemit is growing more beauty. Keep it up sir. Best of luck for you. @surpassinggoogle I still have some issues posting via the steemgigs.org website. What is to be filled in the requirement box?? What do you do when you writes and nobody seems interested in your write up and you keep getting 0.00 upvotes. One is bound to lose steem. I think I will give steemit a break and channel my megabytes and time to another thing. Awesome! I always liked the steemgigs project but I never knew theres so much life in it! I guess whatever you do, you put a lot of passion into it and you create simply amazing things! Just the right gig needed on steemit. Surely you are adjusting the world. Many people here on Steemit discuss how Steemit can be made appealing to potential users. I think it is such inventions like Ulogs and Steemgigs which will in the short as well as long run entice many many people to sign up for Steemit. I mean, look at YouTube and Facebook. Many on Facebook post about their everyday life, and on YouTube many people eventually drift towards posting about their travelling and so forth. So when here on Steemit we ponder what exactly the goal is - should it be exclusively a platform for high-quality censorshop-free content with the predominant part being readers, or should it be a platform where all peoples' content will be successful ?- by introducing your Ulog idea you are perfectly bridging this delicate transition from elite platform to mass-adaptation. And of course it is mass-adaptation which will benefit all of us in the most positive sense! So stay tuned, for the Universe is in the middle of conspiring something wonderful for all of us! Thank you! :)I love steemgigs because everyone just always have something to offer. It gives talent to the untalented. Terry, I personally appreciate you and your heart for the people of the Philippines as wells as other eastern Asian countries. I have set @seemgigs for vote and @surpassinggoogle as proxy. I love the Ulog and I al also a member of Steemgigs. Without a doubt you worthy of our full support. Oh yeah @surpassinggoogle I was wondering if there are people you know who could help create a gaming tournament where one would win steem dollars. I'm trying to set a Mario Kart one on the nintendo switch, but do you know anybody else who would be interested? Thank you. While SteemGigs is trying to create a revolution in the freelancing market, using the beauty of steem's blockchain and its community; it is also trying to improve issues like "healing content" and "discovery" here at Steemit and is looking to test new paradigms, in an attempt to explore the vastness of steem's beauty, for example, we would try to add other facets to steem's "reputation model". @surpassinggoogle, thank you for this update on steemgigs.org. I have heard of it in passing but haven't really known how it works until I read your post. I'll take the time to get to learn and know how to use it. Also, I like the fact that steemgigs.org is not operating independent of steemit. It's such a great idea. Thank you, and I look forward to using steemgigs.org. Hope to join steemgigs and to experience its goodness that brought to people, the transparency and privacy is a good thing there is. My wife @roselyn028 who had meet Sir Terry keep telling me that its really good and is becoming better in the near future it is just like the author of it @surpassingoogle who's trying to make life better on the platform. Oh boy I can't wait for the 3rd Steemgigs Discord talk and people will be ready and listening again. We are happy that you will do it Saturday and will hope that the internet will cooperate. Steemgiggers are the dreambuilders and I like how you want a reputation based on testimonials and respect. Hear you on Saturday then. Yes looking forward to it and I saw some of the new things and I am pretty excited to see people get more active and dream building in Steemgigs. Sir Terry I would like to xtend my gratitude to you on how much you dream high not for yourself but for the benefits of others steemians.As i always said all people that I knew from the beginning are all backing you,your goal and your dreams.Most of us are using #steemgigs in our posting most esp our #ulog.Anyway, thank you for giving us our free footers. Steemgigs as well now is really good and improving not like the other month passed, it was a little bit harder to type the words but now it is going fine.Im am hoping for the best of your dream Sir Terry.God bless you.And we will be happy that we are with you in this community. Ulog is a brilliant and great idea for all steemianos, steemit is and always will be the best ! thank you, mister terry! @steemgigs is a great avenue of expanding our horizon here in Steemit. Thanks @surpassinggoogle for updating us about @steemgigs. You have our 100% support on your projects. Congragulations sir @terry, you are awesome intelligent person. I admire you for being helpful to steemians like me. Wow. It's a pleasure for me to see that you used the gif that I created. Galing ng ginawa nyo, naappreciate ni SG. steemgigs.org truly is different, it gives steemians a chance to grow. Its a pleasure to be inspired by you brother Terry. I will continue enhance my self by the help of @teardrops and @steemgigs . Steemit have been an addictive substance in my life, meaning it has been now integrated in my daily life. There is no flaws in steem or the community its all part of continued envolution! I am super thankful of being part and looking forward for more in the future and better days of the community. With steemgigs and all its facets its not impossible to make our dreams possible. Super thanks and more power.....! I have not used @steemgigs much. But I hope I will soon use it. Indeed you are God sent to this generation. The only way I can pay back is to pray for you and your family. SteemGigs is not only its own website. It is being built to amplify steem's beauty too and even "steem" is still in a state of evolution. I'm happy that steemgigs is already top 19,500 sooner it will go up because many Steemians using it. I reaally want to use it, but sometimes I have hard time to use it because it's a little bit hard to post. But I know someday it'll be better. The Ulog tag has made posting on steemit easier and more fun for me. I used Steemgigs but it said that there's something wrong with my url so I went back to Steemit. Anyways, I love Steemgigs because it gives me the chance to show the world of my ability and resume those hobbies before. I wish that if I'll be posting in Steemgigs later, there'll be no error. Anyways I was very stunned wd the Steemgigs interface and its editor because when we upload pictures, it's faster than in Steemit. It's very easy to style the fonts. The only issue was when I encountered that error I don't know why Sir.But pls.forgive me if I was ignorant about it maybe I could ask my friends. I also began posting ulog. You have many projects I missed to support because of busy days but now I'm back and I wanna hear your voice on discord this Saturday. What time will it be? Are you a human? You're a superhuman who can do multiple things in Steemit. You used your ability and intelligence in a good way. Many people benefit all your projects and you've helped thousand lives including my family. God bless you Sir. I WISH to see u in person soon. I'm sorry if we failed to meet u when I went to Manila because of financial shortage but soon in God's will. I miss you Sir. How are u? How is your father? Insight Into Further Enhancement And Growth, That https://steemgigs.org Seeks To Bring About For Steem.surpassinggoogle (70) in steemgigs • 1 hour ago This is an important update post about https://steemgigs.org and everything that @SteemGigs constitute. In this post, we would like to give a brief general overview, history and insight etc related to the development and completion of especially https://steemgigs.org We will like to explain its gradual evolution and show gratitude for your ever-present patience and implore that you kindly exercise further patience. It has been a slow journey and this we know, but it has been an existing journey. While a completed https://steemgigs.org can easily be seen as a representation of the entire journey, it only constitutes part of the journey. Identifying with this, will help us exercise some more patience with regards to the completion of the website. @steemgigs has existed before https://steemgigs.org. It started right here on steemit, under #steemgigs. Then continued into a now solid SteemGigs community on the discord, containing more than 4,500 steemians. In my own opinion I will say that is only a foolish person that will not want to wait for the final completion of a good thing like #steemgigs. The expectation of everyone as related to what the platform is bringing to the table for everyone to see. It's a vision that cannot be push aside because it core objective will give voice to everyone and bring about EQUALITY to the steemit platform. Just trying to imagine what #steemgigs will turnout to be. @surpassinggoogle should move on and as well watchout for what his handy work will do to lives all over the world. Below is the link my first #ulog post. If you have spare time kindly check it out. Massive traffic. Just six days!. @surpassinggoogle knows how to get people involved!!!. Genius. More traffic to come. It is such a great move. Thanks for filling us in sir Terry @surpassinggoogle.... Steemgigs has a lot more to achieve and it is a very heavy project but I trust the man/Brain behind it which is you. Steemgigs.org has indeed grown at a fast unspeakable rate. Thankyou for influencing this massive growth @surpassinggoogle. It has been life changing for multitudes of users. It is really massive. Redefining a lot of things and it keeps getting better. Everyday steemgigs.org looks for better ways to enhance it's essence and it's power which is everone. Steemgig has help me alot @surpassinggoogle, i visit the site all day and i read things bout it all day. But i still don't know what to write on steemgigs as the name (everyone has something to offer). @surpassinggoogle can you give me a clue of how you become a bigger blogger. I love all your post it gives me life, and wisdom. I have put one gig as by now but I'm planning to make more gigs to according to my skills, I'm a graphics designer. Hopefully, I will get a good response. Sir here are my 4 #ulogs, Have a look on these. Waiting for your response sir! Done voting @steemgigs as my witness. Also thank you for explaining how @steemgigs is doing and thanks for the updates. Surely, @steemgigs will be a huge success. @surpassinggoogle thanks for all this effort you are doing. A debt of gratitude is in order for filling us in sir Terry @surpassinggoogle.... Steemgigs has significantly more to accomplish and it is an overwhelming task however I put stock in the man/Brain behind it which is you. "SteemGigs was born to be a "Dream-Building" center." Good evening sir Terry,hope you are having a good day. Thanks for your great work on stemgigs. I know things will work upright on steemgigs soon. Our patient will never till we reach our destiny land in wish yiu are taking us to. No matter who you are and where you are. Vote for @steemgigs as a witness. He is far so helpful than you can ever imagine. think it is such inventions like Ulogs and Steemgigs which will in the short as well as long run entice many many people to sign up for Steemit. Beautiful update about #steemgigs @surpassinggoogle, it has really open doors to great steemians. While SteemGigs, tries to create a revolution in the freelancing marketplace, using the beauty of the steem blockchain and its community; it also tries to enhance matters like "content curation" and "discovery" here on steemit and looks to try new paradigms, in a bid to explore the full vastness of steem's beauty. It has birthed so many beautiful tags which has come to be a household name on steemit. With steemgigs i truely believe that everyone actually has something to offer on the steem blockchain. You made it happen @surpassinggoogle. You are the boss. Patiently waiting the update for the next show on the discord channel. While the issue of transparency isn't over the board yet, I still think there should be some form of privacy sort of. Steemgigs is ready to offer that. I'm a steemgigger and a dream builder. Steemgigs have played a major in steemit blockchain. Lol, i'm a motivational writer who is motivated. I thank you for those awesome initiative of yours to making the world a better place. We can do it, if we put our heart to it! Thanks for @ulog, @teardrops, @steemgigs, @untalented etc. I hope to see steemgigs running around in full capacity soon. Steemitgigs Es una de las cosas o es uno de los proyectos mas satisfactorios que hemos tenido en steem, Nunca pensé que un simple usuario causara toda esta alegría y toda esta unión, es increíble como conocemos a diario diferentes y múltiples cosas es algo simplemente impresionante. i want to thank you because you spend much of your time helping other steemians, God almighty will reward you with every of your heart desires. I have never blame myself for using your tag because it end up puting smile on my face after when you visit my blog through it. Wow! steemgig.org is really awesome, i just love the concept behind it and the fact that it is still linked to steemit. You are really a definition of a hard worker and may God grant you more grace sir Terry. It is being built to amplify steem's beauty too and even "steem" is still in a state of evolution. Of a surety, it has amplified steem's beauty. It has promoted steemit in more than one ways. I am glad you are behind this great platform. SteemGigs is the first experiment that have form the basis for all other projects such as @teardrops @ulog. Steemgig is a place everyone has something to offer. It is a place for everyone. None is being discriminated. I will continue to be a member of this evolving initiative; steemgigs!! Very well said you really is a man on a mission sir terry, i really admire and loved your work, godbless and more power!!! Steemgigs.org is the new step to continue with the dream and to solidify the community that is already quite united, @steemgigs has too many projects involved, believe me it will grow very fast. You just have to work hard to make it great! Yes, way bigger and better. 2,029 in six days? This is massive!. Wow. Steem cannot completely be heard and adopted with out having exceptional apps and websites like steemgigs. Wow Great..😁thank you sir terry @surpassinggoogle for sharing this awesome platform ,,#steemgigs ,we have more something to share .... A blogs 😁good job..
Steemgigs is a real community in which we make something thing to offer. In this platform we can share our best talent with respect. In steemgigs discord talk show we can gain more knowledge from all member of the community and also by our @surpassinggoogle sharing us the update of @Ulogs and @steemgigs. I should be lucky to be a part of the biggest community. I'm so glad to watch and see the @Steemgigs evolve and grow also seeing the fastest grow of @Ulogs entry. Hiii great @surpassinggoogle, your all efforts for the community are no doubt impressive and appreciate able. you always support us and do all the time for the betterment and development of Steemit. several months ago I already Cast My Vote of Witness for you. I love steemgigs because everyone just always have something to offer. You see this is why I’m in love with steem gigs but I haven’t get a hold of the group , I need to belong I tell, to greatness, to a vision that envisions a vision. This is an assurance of promo steem , preaching the gospel to the whole world. 'However, as you have seen, in the underlying core of the SteemGigs model is a "real-life" paradigm (a school of life curriculum), to where every SteemGigger is "a dream-builder, who is also the awesomest version of "human".. I find this statement helpful. I am more eager to use steemgig.org now because of its improvements, because last time post in steemgigs.org, I cannot edit my post in Sttemit but yesterday I had a new post, I tried to edit and ot was successful. Thanks sir Terry @surpassinggoogle for keep finding ways to make Steemit community better. More power to you! Sir terry is a big impact to me , he is brilliant and I salute him . Because of his brainy mindset and special skills..thank you soso much sir terry for sharing this to us you giving our life back alive and sharing though and storiesI...we salute you and we love you all here at steemit leyte. 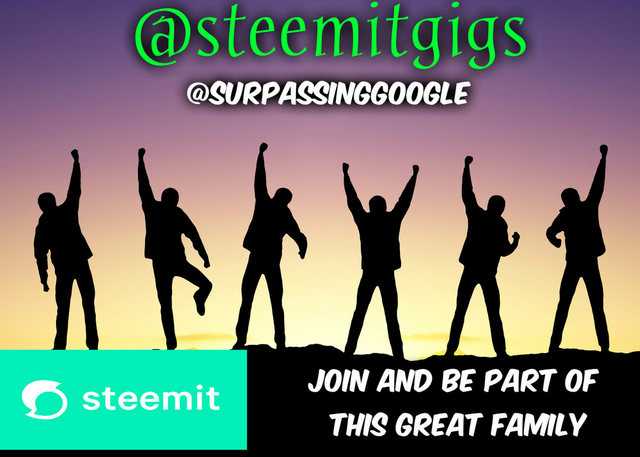 Steemgigs has everyone something to offer are give oppurtunity to us and to share our hidden talent to other that gives a lotof inspiration to all steemians..thank sir @surpassinggoogle on this..
Steemgigs is very nice. It helps a lot of steemians especially those steemians who were untalented like me. Sir Terry, I hope that there would be a video or something that help us especially those who don't know yet how to use steemgigs. A video that guides newbies and a video for those who do not know how to use steemgigs. Thanks @surpassinggoogle for creating #ulog. Other steemians can express their emotions to others. Thank you for helping us steemians. 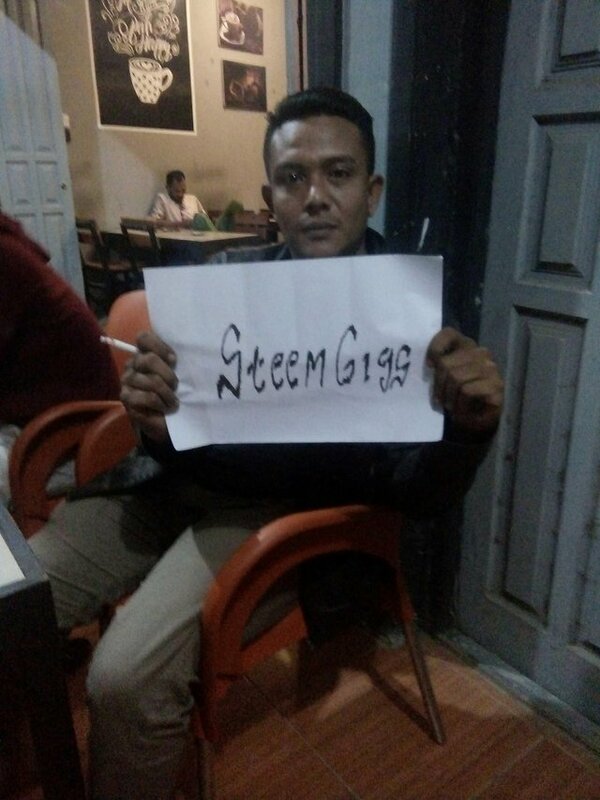 I am one of the witness and member of steemgigs.org @surpassinggoogle know's it because i posted everyday in steemgigs and im thankful and grateful because it helps me a lot enhancing my skill in photoshop-editing and i earn from it, to my customer. Thanks @surpassinggoogle just continue what have you done in steemit. This update gave me more insights into the problems https://steemgigs.org tends to solve. But i'm still having problem using the site regularly as i wish to post my articles via http://steemgigs.org but i only got one particular model which is more of a built-in template that only asks me what service i can do for steemgigs. Maybe there's something i'm really getting wrong here. This is a good time to solve this mystery on my mind. I'll appreciate it @surpassinggoogle.